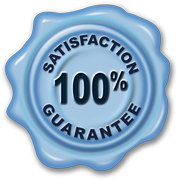 Everything Swimming Pools is a licensed and insured pool contractor that provides quality pool tile repairs for all of San Diego County. Our California state contractors license #974402 allows us to legally perform these types of pool and spa services. Always be sure that when hiring a pool company, that they are a licensed professional. If not, they can not be held responsible in the case that they perform poor workmanship or run off with any of your money. Pool tile repair is a common need due to the fact that here in the San Diego area, we occasionally encounter small earthquakes along with shifting in the ground that can cause this problem to arise. 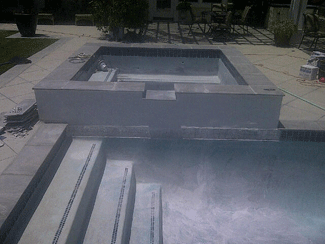 Swimming pools and spas are made of cementitious products that do not hold up to shifting and movement. Because of the rigid nature of the materials, you will over time experience some sort of cracking or damage. This may happen causing you to have a crack in your pool surface, broken and cracked pool tile and even having your pool coping stones come loose. No matter what the problem might be, we can help. We have skilled technicians that have been working on swimming pools for many years. This gives us the ability to look at and understand the complete scope of the problem along with providing you with a detailed account of what is needed to make the necessary tile repairs. After our service manager has performed a pre-site, we will schedule a time that works for you to come out to make all of the pool tile repairs. Depending on the size of the job will determine the length of time it takes to perform the work. In most cases, it will take between 1-4 days to make any small to large scale repairs. The first steps taken when doing a pool tile repair is to remove any loose or broken tiles along with prepping the surface. This will make all of the area that we are going to be working on free of any loose debris and flat so that when the pool tiles are reset, they will lay flush on the pools’ surface. If this step is not taken, you may see that the tiles are not even making it look bad. That is usually a sign of poor workmanship. The next and final steps are to reset the pool tile onto the surface making sure that they are secured with the appropriate amount of thin set. This will help ensure that the tiles will not fall off due to areas that are hollow. If you have the old pool tile and it is able to be used, we will use them. If the pool tile is cracked, broken or missing, we will need to find the closest match so that the pool tile repair blends in. This is not normally a problem but if it is, we will work with you to find the best match that works. We always make sure to have you help in making the decision so there are no problems when the job is complete. Once the pool tiles have set up, we can then grout the tile. 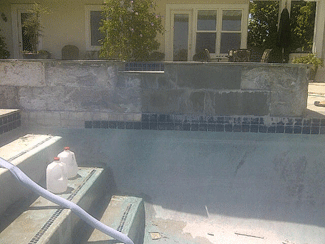 Once the pool tile is grouted and dried, there will be a slight haze that simply needs to be wiped off. 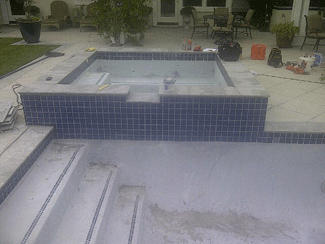 Once all of these pool tile repair steps are completed and 24 hours have passed, you may then refill your pool or spa. We always highly recommend that you wait 24 hours to give the pool tile materials a chance to cure so that they set up as strong as possible. If you live in the San Diego area and have any questions or are in need of a pool tile repair, we can help. Give us a call or fill out our contact form, and we will contact you. Copyright © 2019 a great San Diego pool remodeling company..